Through the first six weeks of 2011, Raw and Smackdown's ratings patterns have been in lockstep with similar ups and downs. Smackdown's week-to-week declines have been more dramatic than Raw's, as Smackdown is more prone to fluctuation compared to Raw, which has a firmly established presence on Monday nights. 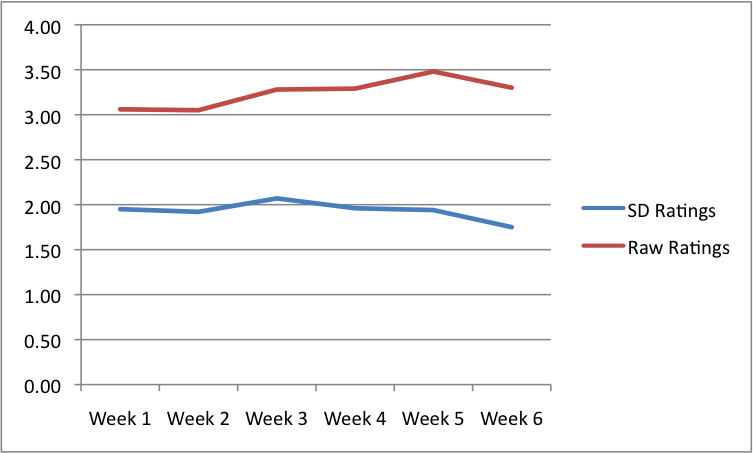 The following is a break down of how similar the ratings & TV viewership patterns have been from week-to-week starting 2011. Result: Both shows have similar changes - ratings down, viewership up. Result: Very similar increases in ratings and viewership. Result: More dramatic drop-off for Smackdown. Result: Strong ratings increase for Raw, minimal gain for Smackdown. Result: Significant drop-off for Raw, very significant drop-off for Smackdown. Chart: The chart below shows the pattern of matching ups and downs from Raw and Smackdown through the first six weeks of 2011.